The American Blue Gascon Hound is a very intelligent dog. Very devoted to its family, it makes a good companion dog. It does well living indoors and plays a fine guardian to his family and home. They are usually best with older children, but can also do well with younger ones. Some can be a bit dog-aggressive if the owner is not a strong leader relaying the message to the dog that is unacceptable behavior. Owners need to be this dog’s firm, confident and consistent pack leader in order to bring out the best in him. Socialize well, preferably while still young, to avoid them from becoming reserved with strangers. The American Blue Gascon Hound is a passionate hunter and should not be trusted with non-canine pets. This breed is extremely alert, attentive, and able to work over difficult terrain in bad weather. Do not let this breed off the leash in an unsafe area, as they may take off after an interesting scent. They have a strong instinct to tree animals. Raccoons inhabit all states and provinces in the US mainland and Canada, and have for centuries been pursued by hunters. Each year, hundreds of licensed night trials take place. Each trial lasts approximately three hours and involves three to four dogs. Points are given according to the dog's ability to find, trail and tree a raccoon. Points are lost for treeing game other than raccoons. Each dog has a unique "voice" which its owners usually can recognize. The American Blue Gascon Hound does not have a normal sounding bark, but rather a loud bay cry that almost sounds like a short howl. American Blue Gascon Hounds are curious and have a tendency to follow their noses. If they pick up a scent they may wander off and not even hear you calling them back, or not care to listen, as they will be too busy trying to find the critter at the other end. Take care when letting them off leash that you are in a safe area. The American Blue Gascon Hound has extremely good eyesight, which allows it to work well at night. The American Blue Gascon Hound excels in these trials. They can also be used to track fox or even cougar. The American Blue Gascon Hound has a fearless and warrior-like approach to the hunt. This breed may drool or slobber. The American Blue Gascon Hound is not recommended for apartment life. They are relatively inactive indoors and will do best with at least a large yard. Do not let this breed run free off of its lead unless in a safe, secure area. Coonhounds have a tendency to follow their noses, and if they catch wind of a scent, they may wander off for hours following it. Daily vigorous exercise is needed, which includes a long, brisk daily walk. Coonhounds that do not receive enough mental and physical exercise may become high strung and even destructive. This very anxious and energetic dog has been bred for severe physical exercise. Coonhounds are born natural hunters, so they have a tendency to run off and hunt if they are not kept well-fenced while exercising on their own. They have no road sense at all, so they must be kept in a safe environment. An occasional brushing will do. In order to keep the ears clean and infection-free, regular attention is a must. 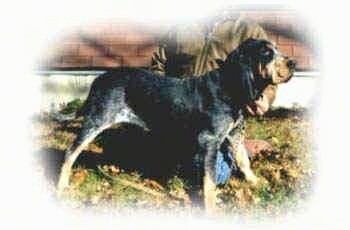 The American Blue Gascon Hound is a larger version of the Bluetick Coonhound with its original working ability reflected into the lines. The American Blue Gascon Hound Association states the dogs are prized for their scenting ability, stamina, ruggedness, agility, perseverance, desire, and a long deep bawl or bugle voice in the pursuit of tree/bay game.